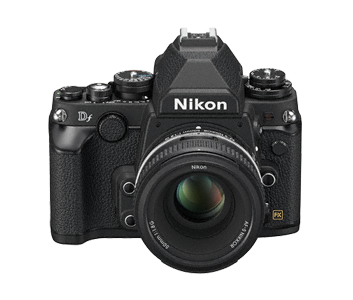 The new Nikon Df dslr. Nikon finally announce a retro dslr which many have been asking for. Whether it is a camera for me I doubt very much. Compatible lenses Compatible with AF NIKKOR lenses, including type G, E, and D lenses (some restrictions apply to PC lenses) and DX lenses (using DX 24 x 16 1.5x image area), AI-P NIKKOR lenses, and non-CPU lenses. IX NIKKOR lenses and lenses for the F3AF can not be used. The electronic rangefinder can be used with lenses that have a maximum aperture of f/8 or faster (the electronic rangefinder supports the center 7 focus points with lenses that have a maximum aperture of f/8 or faster and the center 33 focus points with lenses that have a maximum aperture of f/7.1 or faster).